Ecommerce ecosystem has witnessed a steady growth over the past 2 decades. According to a report titled “Worldwide Retail and Ecommerce Sales” by eMarketer, retail ecommerce sales saw a 24.8% increase in 2017. The statics given here are of course “good news” for the entrepreneurs who are looking forward to start their own online venture. The ecommerce sphere is currently packed with opportunities for new online businesses. If you have an innovative business model that can meet the demands of experience-hungry society, it’s time to take a step forward with an ecommerce website. Although there are various online business models, the core agenda is to sell online. New entrepreneurs who are looking to build their online presence need to review every factor that a specific business model delivers. It is a challenging decision to select an ecommerce platform with the right tools and technology, especially for new entrepreneurs. To help businesspersons, there are free online demos that enable you to access a particular platform. Also, you can go through user-reviews for better understanding. While looking for a perfect ecommerce platform, you need to consider supreme factors that are important from customer as well as business prospective. Being a part of the IT industry for more than 14 years, I have mentioned crucial factors that should be considered while choosing an ideal platform to setup your ecommerce website. SaaS-Based Solution: SaaS is an optimal solution for small vendors who need to target local audience and have limited requirements. There is no additional maintenance cost for your website as the hosting service providers are responsible for the same. The ideal examples are Shopify and Bigcommerce. Opting a SaaS-based solution means that you don’t completely own your ecommerce website. Instead, you pay the hosting service provider at regular intervals to run your online store. You enjoy the functionalities and services as long as you pay the subscription fees. To add custom features such as Payment Gateways and Analytics, you need to pay an additional cost. SaaS-based solutions don’t support all business needs. Also, it lacks the ability of complex customization. Moreover, many SaaS based solutions charge a transaction fee, which means effective revenue is reduced. 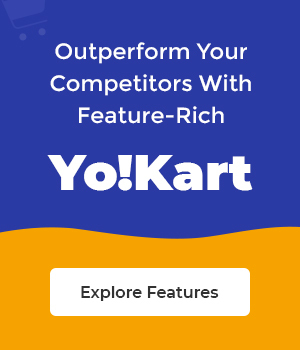 The ready-to-launch options, such as YoKart, are quite suitable for certain segments, like startups, micro businesses, and small and medium-sized enterprises. Value for money and easy options to scale up are the reasons why these solutions are preferred over custom or SaaS. Custom Solutions: A custom ecommerce solution is most suitable for the stores that need to address specific operational challenges. If your business model demands high-end customization, then there are solutions like Shopify Plus, Magento (For Mid and Enterprise Businesses) and YoKart’s GoCustom. Custom solutions are expensive and require an experienced service provider. So if you choose this solution for your upcoming store, I recommend business persons to complete the business analysis process first. Analyze the functional requirements before investing in a custom solution as it will help you define the requirements and demarcate your budget, which may otherwise stretch out due to undefined cost. Featured product listing – List select vendor products on the homepage. Advertisement Management – Display vendor advertisement. Which Revenue Stream is Better for your Ecommerce Venture? At the point of starting a new venture, it’s nearly impossible to predict when the business will outgrow the expectations. Flexibility in a solution is gauged to keep up with changing times. The ecommerce platform that you choose today should be flexible and scalable enough to meet the future requirements. Planning now will help to add such features with the least investment of time, effort and money in future. The three different solutions discussed above offer varying flexibility and scalability. Although SaaS-based solutions allow you to change the design and add new features, you cannot change the hosting service. Conversely, owned readymade and custom solutions provide the best of both flexibility and scalability. You can choose your own hosting service provider, get the design of your choice, and change the business model as required. Imagine that you have successfully launched your ecommerce website. But after a span of time, you may face some technical issues. To resolve the bugs and errors, you definitely need technical support for the flawless functioning of your website. Otherwise, you may suffer huge order loss which will of course hit your business. In worse condition, you may even lose loyal customers and their trust. Therefore, a team of technical experts must be there to help you out immediately. Most SaaS-based solutions offer support primarily via forums, email, and live chat. Basically, what it means is – roll up your sleeves and get to work. If you go for ready-to-launch or custom solutions, screen sharing-based or on-site support is provided to address the problem in real time. Furthermore, you can sign up for an annual maintenance contract and avail discount, if applicable. In a few cases, you can expect the technical support to be free initially but in the long run, you need to sign up for an annual maintenance contract.